This Coconut Caramel Crescent Ring is super simple to make and uses everybody’s favorite store-bought canned crescent rolls. Make one today!! 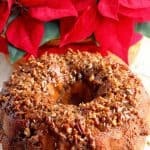 **Please Note – The printable recipe card with detailed instructions, complete ingredient measurements, and nutritional information for making Coconut Caramel Crescent Ring is available near the end of this post. I’ve been making this crescent ring in one form or another for as long as I can remember and it’s made many appearances on our annual Christmas Brunch party menu. This year I decided to add some coconut and half & half to the brown sugar, butter, and nut layers and the result was simply delectable! I’ve never posted the recipe before, but it’s high time to share so you can enjoy it too. Melt the butter, brown sugar, pecans, coconut, and half & half in a saucepan over medium heat. 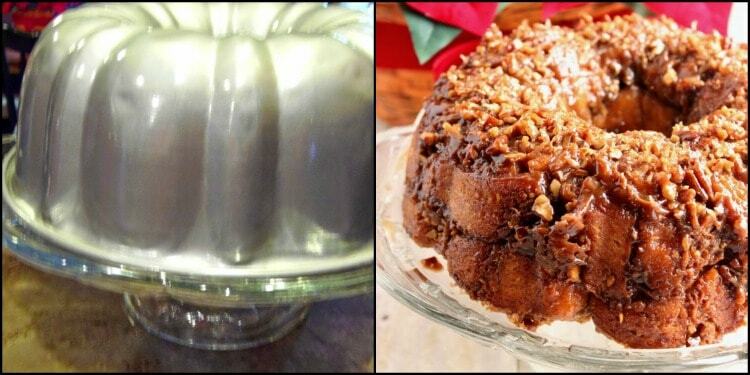 Pour 1/3 of the caramel sauce evenly in the bottom of a prepared bundt pan. Top the caramel with 8 crescent roll slices. Top the crescent circles with another 1/3’d of the caramel sauce, and top the sauce with the final 8 crescent circles. Pour the remaining caramel over the crescent circles and bake in a preheated oven for 60 minutes. Allow the ring to cool for about 10 minutes and then carefully invert the crescent ring onto a serving platter. Carefully remove the pan and allow the ring to cool completely, or serve while slightly warm. 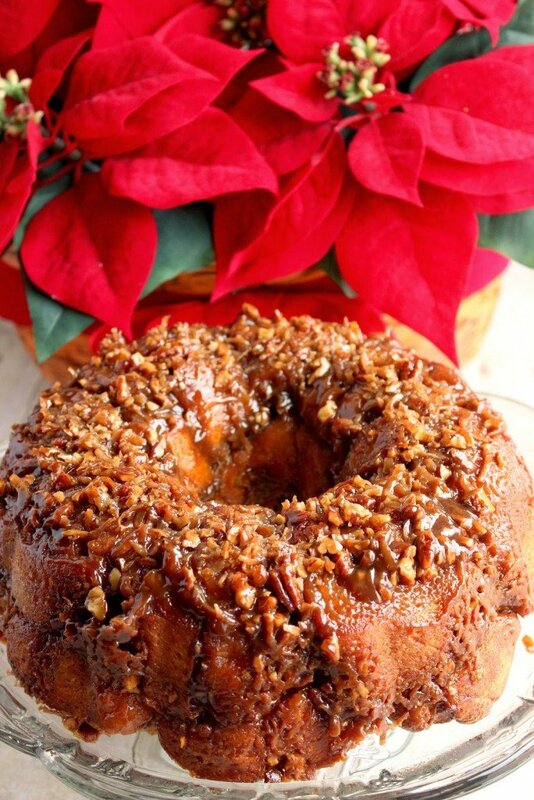 Below is the printable recipe card for today’s Coconut Caramel Crescent Ring. If you’ve enjoyed this recipe and look forward to making it (or have already made it), I’d appreciate if you’d take a moment to give it some feedback by way of stars near the comment section at the end of this post. Thank you so much! This Coconut Caramel Crescent Ring is super simple to make and uses everybody's favorite store-bought canned crescent rolls. Prepare a bundt pan by spraying it with baking spray. Set aside. Remove the crescent dough from the tubes but do not unroll them. Cut each crescent dough into 8 even pieces. *Note - A serrated knife works best for this. Set aside. Melt the butter in a saucepan over medium heat. Stir in the brown sugar, pecans, and coconut until the sugar is completely dissolved. Reduce the heat to low and stir in the half and half and simmer for 1 minute. Remove from the heat. 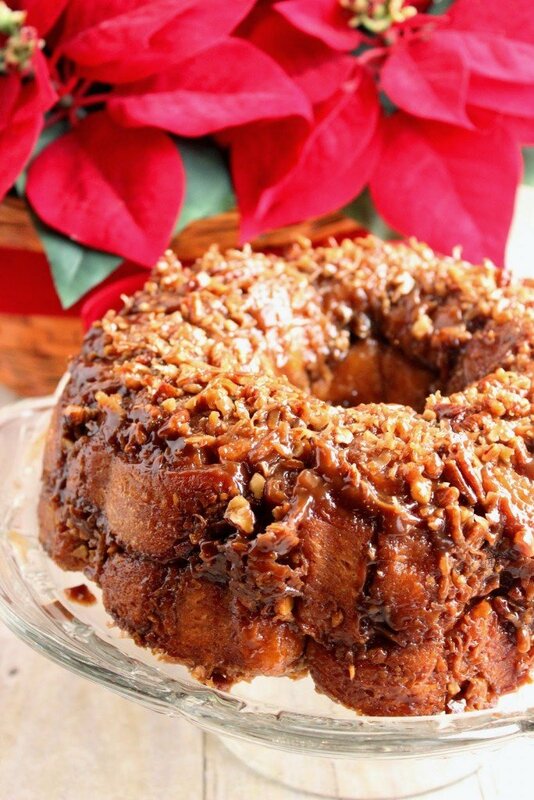 Pour approximately 1/3 coconut caramel sauce into the bundt pan. 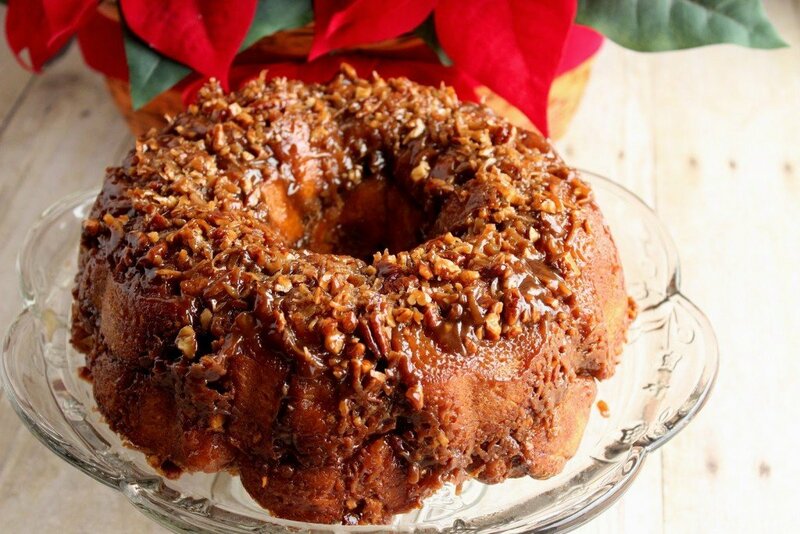 Place 8 crescent circles into the bundt pan over the layer of caramel sauce. Pour an additional 1/3 of the coconut caramel sauce over the crescent circles. Layer the last of the crescent circles over the second layer of caramel. Top the second layer of crescent rolls with the remaining caramel sauce. Bake in a preheated oven for 60 minutes. Remove and allow to cool for about 10 minutes. Turn the crescent ring out onto a serving platter while it is still warm otherwise the caramel will harden and stick to the pan. Carefully remove the pan once the ring has been inverted and allow the ring to cool completely before serving, or serve slightly warm. I sincerely hope you’ve enjoyed today’s recipe for Coconut Caramel Crescent Ring as much as I’ve enjoyed bringing it to you! 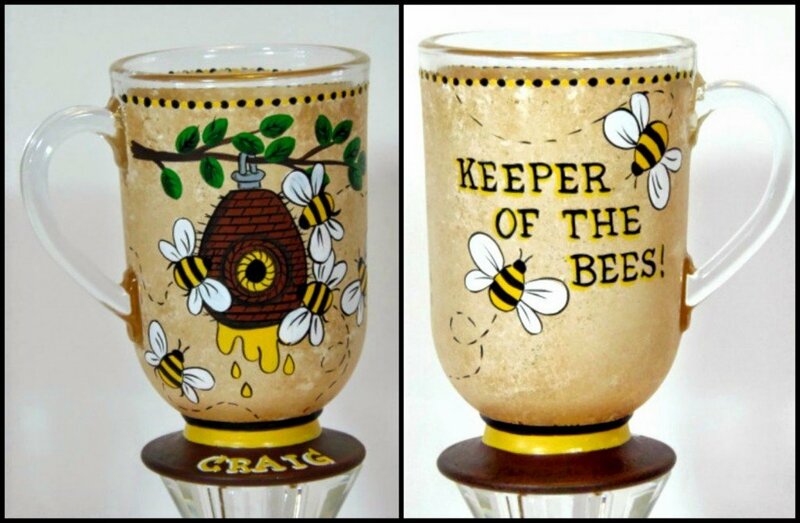 I thought this Coconut Caramel Crescent Ring would pair perfectly with this beekeeper custom coffee mug that I’d painted a few months back per a customer’s request. I love how you totally jazzed up these refrigerator rolls – they look scrumptious! And I'm really liking the addition of coconut. Perfect New Years brunch dish. What a brilliant idea! I never would have thought to do this with crescent rolls. And the combination of coconut and caramel sounds so darn good. Holy moly, renee, what brilliance. Love coconut everything and I am playing with caramel recently. 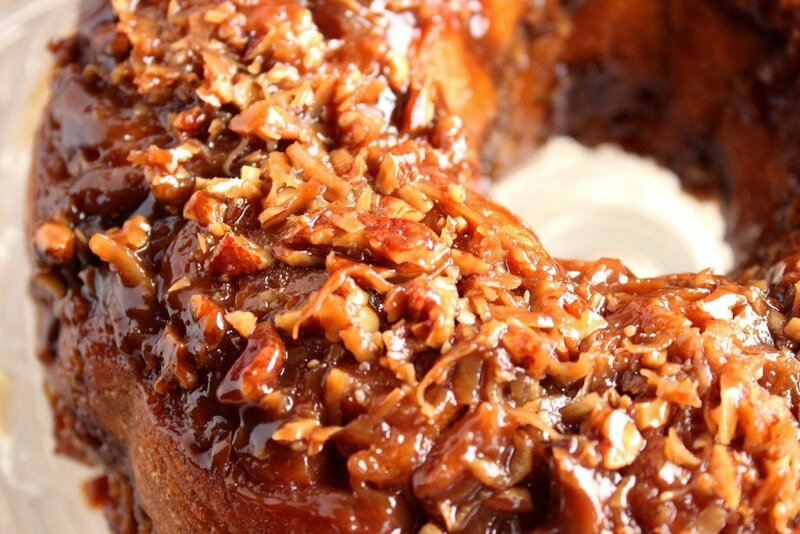 You know we share the love for baking savory and sweet breadst! Happy New Year and all the best in 2015! Oh sweet goodness, just gimme! Love the idea of using cans of crescent rolls! Looks amazing! You had me at caramel AND coconut. I would love to have a big slab of this waiting next to my coffee in the morning. WOW! I can't believe you used store-bought rolls for that. So creative, and it looks soooooo good! This looks wonderful and so easy!!! I would like to eat this whole thing right now…yum! Fantastic! I made these yesterday for our family Christmas party and they were a hit! You are right! This in no way is just a Christmas recipe. Make it all year. Enjoy! It looks fantastic. As soon as I found something similar to crescent rolls in Australia, I would love to make this lovely cake. I wish I knew of an alternative for you, but I have no idea about the products you have available to you in Australia. Wish I did. I’d love to visit!